Reserve manager Pablo Bryant points to a series of yellow dots that run along a patchwork of green on a map detailing the bounds of Temecula’s Santa Margarita Ecological Reserve. The dots represent the tracked movement of mountain lions who use the river valley as a corridor for their habitat. The Santa Margarita River is southern California’s last free-flowing river. The reserve spans the first 5 miles of the river, which Bryant said is one of the most critical corridors for wildlife and habitat biodiversity. “We connect the Palomar Mountains to the East and Santa Ana Mountain to the West for wildlife. Wildlife and animals use the river valley as a highway,” he said. The nearly 5,000-acre reserve is managed by San Diego State University’s College of Sciences and Field Stations Program for the purpose of research and education. The public was invited onto the limited-access reserve in observance of World Water Day Saturday, March 23. Held annually March 22, the United Nations-backed day highlights the importance and conservation of freshwater around the world. As part of their coursework, a group of San Diego State University Public Relations students organized Saturday’s event, “SMER Spring Splash,” which took place from noon to 3 p.m. as a way to bridge understanding between the reserve and the local community. Journalism student Sam Kaye, 27, said many people don’t realize that access to the Santa Margarita Ecological Reserve is limited to the public or the reasons why. “Our goal is to let the public know the reserve is a place to learn from and protect and hopefully we will foster a new community of environmental stewards,” Vivian Lam, a 21-year-old SDSU senior and public relations student, said. As the population in Temecula Valley grows, more people are interested in exploring natural areas. But locals may not realize the reserve is largely off limits except by way of docent-led hikes. The increased interest has led to increased cases of trespassing, pollution and vandalism, Bryant said. “We want to help satisfy the public’s desire to be out here, but do it in a way that doesn’t negatively impact our mission. We want to be able to educate people from a conservation standpoint,” he said. Unfortunately, he said, most of the problems are concentrated at the most critical part of the reserve: at the confluence of Santa Margarita River where the Murrieta and Temecula Creeks collide. No trespassing signs haven’t stopped people from swimming in the river or tagging rocks with graffiti. Bryant is worried about the negative impact to the reserve, he said. Bryant has a close connection with the land, which San Diego State University acquired in 1962. He’s been working on it for almost 20 years and has served as reserve manager since 2010. His idea is to host more public events to help raise awareness and mitigate trespassing and illegal use. This year, volunteers have led 18 public hikes on the reserve. In addition to its cultural significance as the birthplace of the Pechanga band of Luiseno Mission Indians, the area is a means for biological diversity and ecological balance. “It’s the important piece between two habitats,” Bryant said. A huge barrier for wildlife is Interstate 15. So far, the reserve has lost four mountain lions to oncoming traffic. “We are really worried about the populations of mountain lions,” Bryant said. He estimated there to be 20 lions roaming the Santa Ana mountains on the west side of I-15. Bryant said the mountain lions they are losing are dispersing males, who are pressured out of their packs by more dominant lions. “There’s a huge pressure for the lions to find new habitat,” Bryant, who earned his bachelor’s degree in biology from SDSU, said. In order to combat more deaths, he said the reserve is looking for ways to improve habitat connection. “We want the species to be as viable as possible and be able to introduce new genetic material in and out of the area,” he said. Santa Margarita’s headwaters are also being considered as an option to reintroduce native Steelhead trout. The land that makes up the Santa Margarita Ecological Reserve was first purchased by Murray Schloss in the 1920s, before he granted it to San Diego State University. It is now made up of a patchwork of private, public and agency lands set aside for conservation. SDSU manages the reserve’s field stations for research, education and the preservation of native habitat and biodiversity. “The unique landscape they have here provides opportunities for researchers and students to study this area,” student volunteer Kaye said. 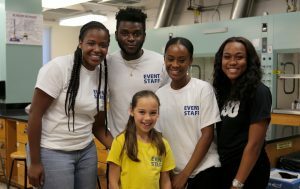 A handful of students volunteered their time Saturday to help make the event a success. About 15 to 20 adults and children arrived to take the guided hike down to the river. Community members also participated in interactive projects such as water testing in the river and painting stones. Chloe Kangas, 23, and her boyfriend Antonio Gutierrez, 24, are both SDSU students. They came to Santa Margarita Ecological Reserve’s World Water Day event to see what the reserve is all about. “We heard it’s the last free-flowing river in southern California, so we wanted to check it out,” Kangas said.